This blog post is the first in a nine-part series chronicling Iris' 46-year battle with bulimia. Today in the United States -- supposedly the land of plenty -- millions of people every night go to bed hungry due to poverty. They simply cannot afford to buy the food they see on the supermarket shelves. In addition, millions are literally starving themselves to death because they are suffering from a condition known as anorexia nervosa. I am not one of them either. 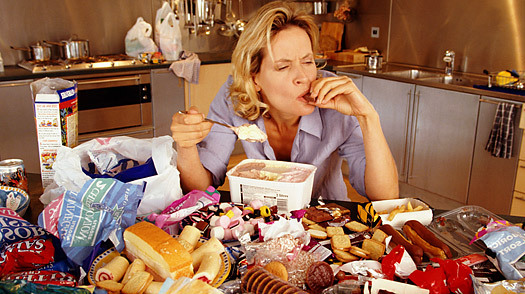 I have the other eating disorder: bulimia -- characterized by repeated cycles of bingeing and purging. Research shows that EDs (eating disorders) cause all sorts of threatening conditions. To name just a few: stroke, electrolyte imbalance, rotted teeth, ravaged knuckles, esophageal cancer, etc. Celebrities routinely die from ED. Non-celebs too. None of the above was of particular interest to me in 1966 when ED first came a-courting me. I was a sophomore, out-of-state transfer student attending the University of Florida in Gainesville. I was 1,000 miles away from my mom and dad for the very first time. My high school boyfriend had just broken up with me. I was unsure about a major field of study. Along with all the changes I was experiencing at that point in my life, my grounding thought was to stay thin. If I was thin, I could cope. And when I found a way to be thin, remain thin and eat all the forbidden stuff I secretly craved -- well -- I thought I had died and gone to heaven. Little did I know that this designated path could very likely lead me there a lot quicker than desired. Little did I know that my brand of heaven would shortly turn into a hell of my own making. This was all occurring in the iconoclastic 60s -- way before eating disorders even had a name. Way before campus counseling centers offered treatment. Way before sorority houses would need their plumbing pipes replaced on a regular basis. Why? Because so many sorority girls were throwing up after carb binges that their stomach acid was corroding the pipes' interiors. When I began bingeing and purging, there was simply no vocabulary to describe what I was doing. At that point, I viewed my strange behavior as not only benign, but as a very creative by-product of my highly functioning right-brained mind. Once again, I had found a clever way to live my life. I could indulge my cravings by bingeing and I could control my weight by purging. And best of all, when engaged in this cycle, my mood lightened, my angst lessened and I remained lean. My cheekbones became more prominent. My love life took off. My hour-glass figure became even more finely chiseled. I went from ordinary looking to noticeable. What 18-year-old college freshman could resist the allure of that? Keeping my weight low was the key to my outer beauty. And my outer beauty was the key to my sense of self worth. So EDdie had found a home and he would reside with me for many years -- the one constant in a life of flux. He was a satisfied tenant. I was a very accommodating landlord. I was slavishly addicted to the needle on the scale as my barometer of appeal and worth. It was a teetering, tottering structure on which to attempt to build a life of resoluteness and self- confidence. But with ED by my side, I had a short-cut to self-sufficiency, control, confidence and consistent and enduring attractiveness. As I would slowly learn over the following decades, there are very few true shortcuts in life. And short-cuts that are not firmly grounded in self-discipline and positive coping skills only lead to dead-ends. Statistics are not easily forthcoming documenting the number of baby boomers eating large quantities of food and forcing themselves to throw up after consumption. Jessica Setnick, MS, RD, CEDRD, published an article "Eating Disorders: An Ageless Affliction" on 12/28/13. She cited the results of studies that "shatter the belief that eating disorders only afflict the young and reveal that boomers have eating disorders at the same rate as teenagers -- nearly 4 percent. And an additional 13 percent of boomers partake in at least one core eating disorder behavior such as binge eating, self-induced vomiting, excessive exercise or laxative abuse." At this juncture, there are over 76 million baby boomers in the United States. I've got a lot of fellow sufferers. Before you click away: This is serious stuff. What's "eating" you? And what's your personal way of dealing with your demons? Please enlighten. Be part of the conversation. If you want more information about Iris's forthcoming book Tales of a Bulimic Baby Boomer, or to sign up for her weekly newsletter, visit www.irisruthpastor.com or follow her on Twitter @IrisRuthPastor.